Once your pieces are traced, you can go ahead and complete the articulations. Articulations are an important aspect of any cut-out break down because without them, a puppet cannot move properly and will not look good. 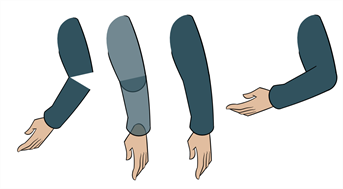 If you are using deformations to animate the limbs, your articulations don't need to overlap. The deformer effect will create the joint for you.